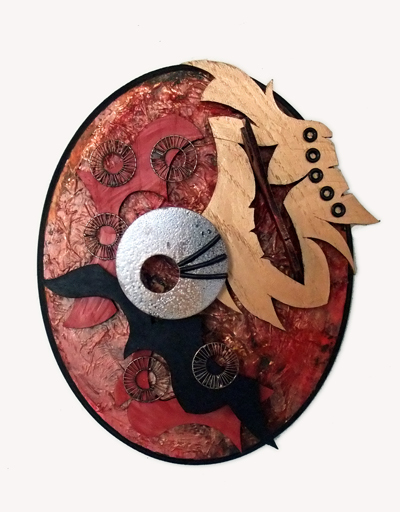 I spent a fun day with a mother & daughter who took a mixed media wall sculpture class last July. 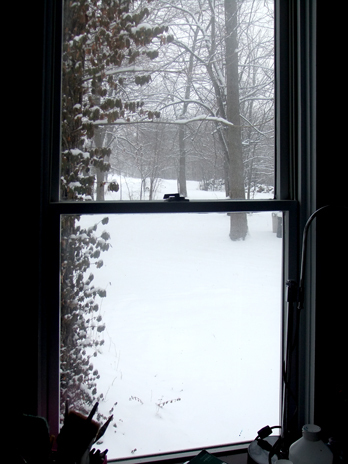 (Yes, I know it’s January…sometimes it takes me a while to get to things!) I thought I’d share the images from the day with you. Seeing these pictures reminds me how much fun it is to assemble wall sculptures. Guess I’ll have to add that to the ever-growing list of things I want to do this year!! On Monday, July 2nd from 10 a.m. to 4 p.m. 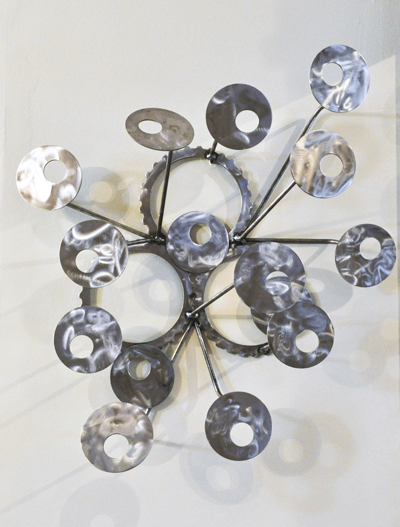 I will be holding a “Mixed Media Wall Sculpture” workshop at my studio. What a nice way to get a little creativity in your summer! Using a variety of materials, including wood, metal & paint, you can incorporate anything into them and just let your imagination run wild. 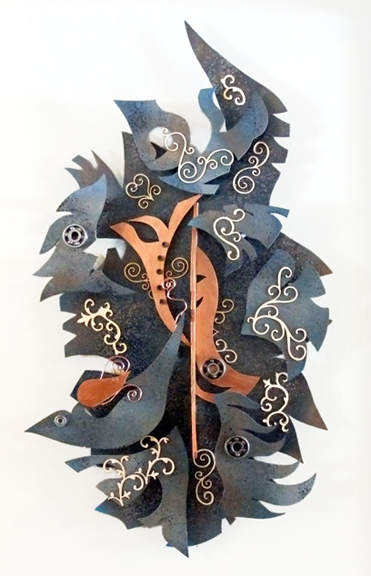 View samples here: Mixed Media Wall Sculpture and Sample work from previous workshop. All materials are included but if you have found objects or other treasure you’d like to incorporate into your sculpture you are more than welcome to bring them! Cost per person is $95 – sign up with a friend and you will each get a discount. Class size is limited to 6 participants so be sure to sign up early! So, yes, this date did sneak up on me a bit! 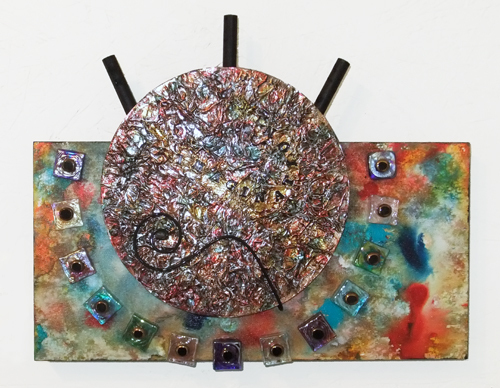 I hope you will be able to join in the class while we created mixed media wall sculptures starting this Wednesday, March 14th, and concluding on Wednesday, March 28th. 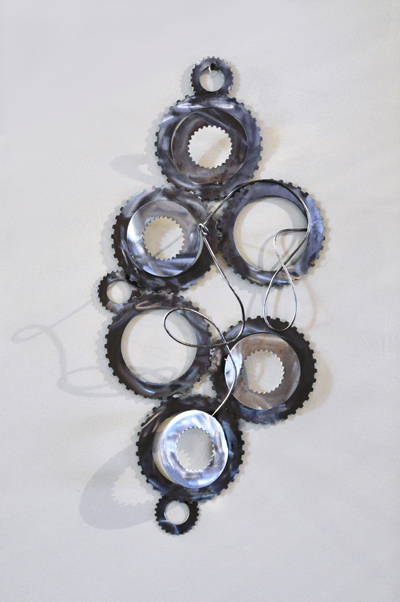 Using wood, wire, aluminum, found objects, paper, paint and whatever else we might want we will design, assemble and embellish unique wall sculptures. Saturday, March 24th – “Creative Collage” – an encore of the February 1st class, you’ll design and create an 8×10 collage on a ready-to-hang wood panel. You can view images and a recap of that class by clicking here. 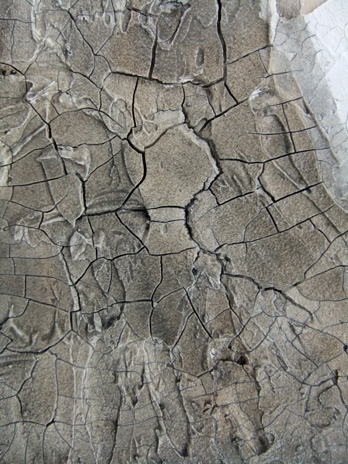 Wednesday, April 11th – “Art from Nature” celebrating Earth Day 2012 a little early (April 22nd is the date) we will create mixed media art that includes natural elements (rocks, wood, etc.) Feel free to bring your own “treasures” to include in your art! 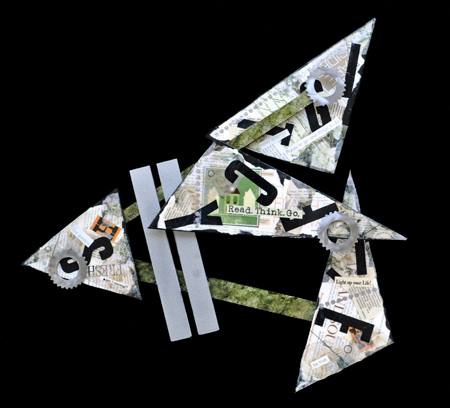 Wednesday, April 25th – “Recycled Journals” – continuing to celebrate the earth we will create small, decorative journals from recycled materials! Saturday, April 28th – “Art from Nature” an encore of the the April 11th class, we may even hold this class outdoors if weather permits! The last two classes before a summer break will be announced soon! I hope you can join in the creative fun this Wednesday! What do you do when you have a client that is interested in your work but this piece is too big? And this piece is too small? And they really like aspects of both pieces? You create a custom piece, just for them, of course! 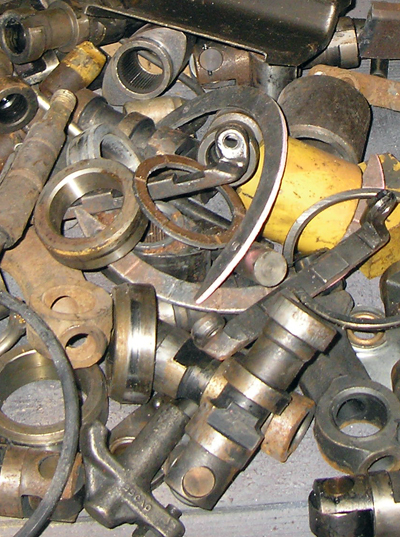 We’d love to create a piece for YOU, too! 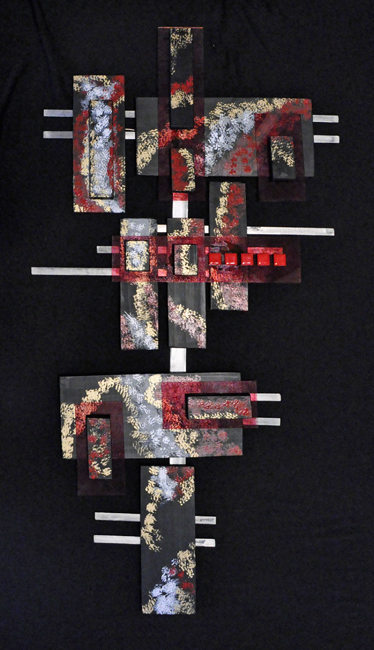 Recently Mark & I created several new pieces of collaborative art. It’s taking me a while to get new things online lately but I can at least get this one posted for you! I even have some progress images. 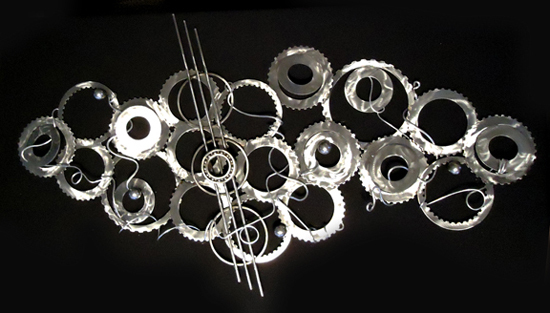 The very beginning was to design & weld the metal that the rest of the wall sculpture is attached to. 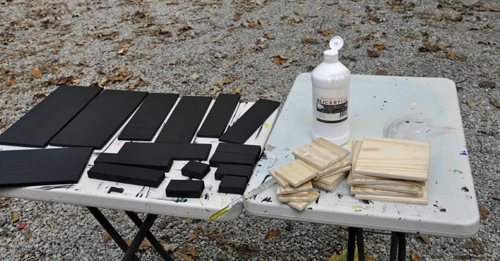 Once that was done I cut the wood pieces, sanded them and began with the painting process with black paint on both sides of each piece. After that it was time to get creative! 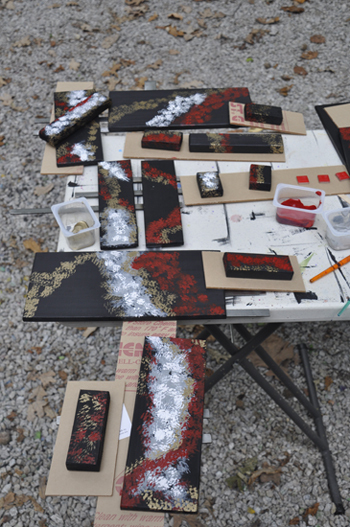 Laying the pieces out in their approximate positions I began to add red, gold, grey & white paint in random patterns across the pieces. 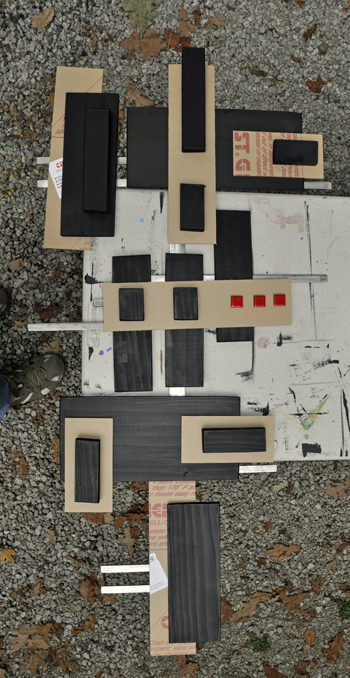 The pieces that look like cardboard are actually shapes cut from acrylic plexiglass that I stained a deep red color and then sealed. Once the paint had dried it was time to assemble the pieces using screws, wood glue and other adhesives (depending on the piece) until it was complete, adjusting the design along the way until I was pleased with it. 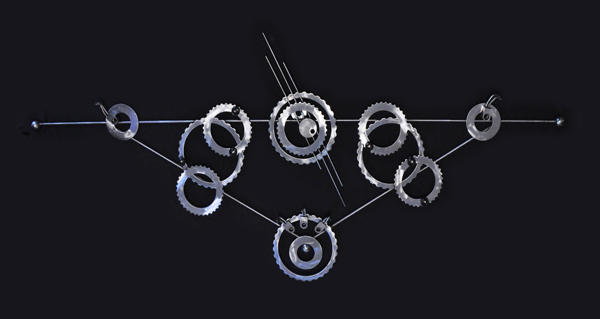 This piece is currently hanging in my studio, why don’t you schedule a time to come and see it in person? I also started two more pieces similar to “Free to Be” that was featured in yesterday’s post. They started as a large image but I wasn’t happy with the black design so I folded it in two and squished the paint around, rather like a Rorschach test. 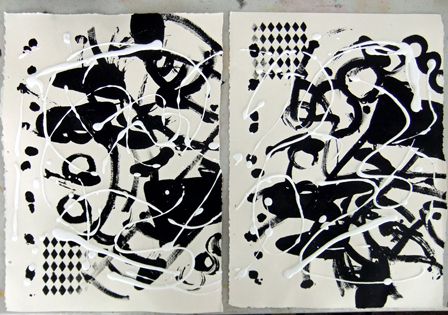 Eventually I just split into two different pieces then added a black stenciled area and lines of white paint to both pieces. One I am painting in yellow/orange/red hues and the other in teal/blue/grey. I should have them finished and photographed for tomorrow blog post, look for them then! 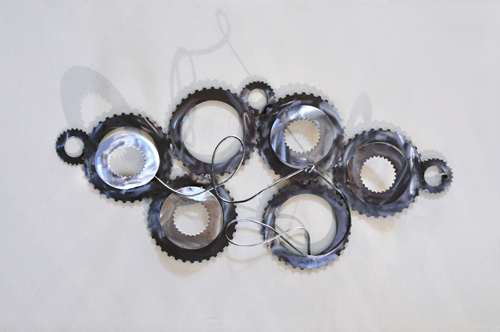 Another project I hope to make some progress with is a new mixed media wall sculpture. 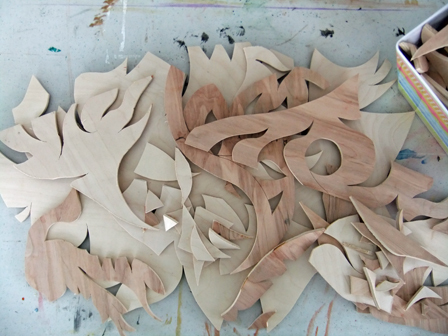 I went out to the workshop over the weekend with a nice 2 x 4 foot sheet of wood and cut it to pieces with the scroll saw. 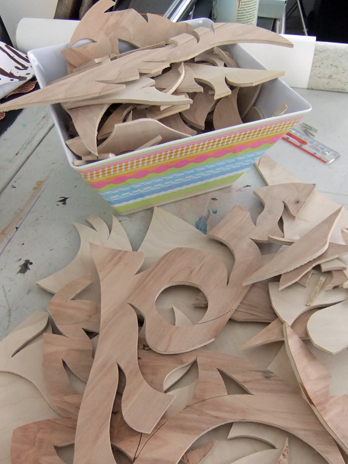 Previous wood cutting has been just geometric shapes or curvy organic pieces but I really played with it this time making a lot more intricately cut pieces than I had previously. For some reason it seemed like every other piece I cut ended up looking like a bird! I’ve had birds on my mind lately, I can’t tell you why or what it means but I keep coming up with ideas for artwork that has birds in it. I’m sure there is some deep meaning in it all but for now I just recognize that it’s happening and go with it. Anyhow, I ended up with a large selection of pieces ranging from less than an inch up to a big “base” piece that is probably a foot wide and two feet tall. Add that to the random pieces I already had in my collection I am ready to start constructing! One of the last things that I “intricately cut” was my thumb. 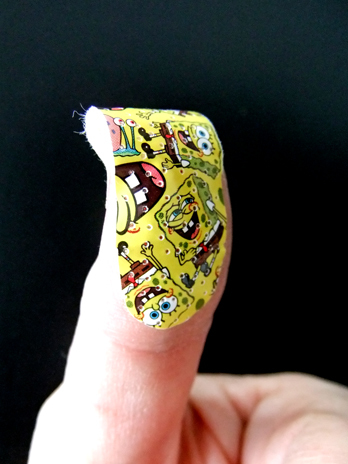 It wasn’t a terrible wound and after a little first aid and a Sponge Bob band-aid I was good to go. As you read this I will very likely be back out in the studio working on these projects today, or others – you never know about me! 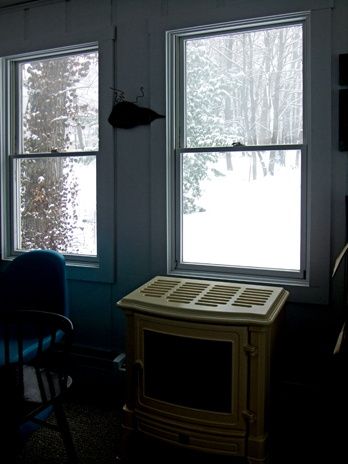 Just picture me sitting in my cozy studio looking out this window at the winter beauty.